Assess any patient with shoulder pain with respect to the patient's age and occupation. Characterize pain according to its duration of onset, location, radiation, timing, and quality. In addition, investigate pain for its relationship to activities and sport. Pain is the most common symptom encountered with rotator cuff injury. Pain usually is located anterolaterally and superiorly and referred to the level of the deltoid insertion with full-thickness tears. Pain is aggravated in activities where the arm must be in an overhead or a forward-flexed position. In an acute injury, pain suddenly is elicited after a fall, after lifting of a heavy object, or even after a trivial amount of force. Following pain, weakness and limitation of motion are the next most common symptoms of a rotator cuff tear. The patient also may complain of clicking, catching, stiffness, and crepitus. Approach the shoulder examination systematically in every patient with inspection, palpation, range of motion, strength testing, neurologic assessment, and performances of special shoulder tests. Also, include evaluation of the cervical spine and upper extremity. Inspect for scars, color, edema, deformities, muscle atrophy, and asymmetry. Palpate the bony and soft-tissue structures, noting any areas of tenderness. The subdeltoid and subacromial bursae can be palpated anteriorly under the acromion, and laterally with the deltoid muscle and the arm in extension. The supraspinatus is palpated anteriorly when the arm is externally rotated and flexed. Hyperextension permits the palpation of the infraspinatus. Assess active and passive range of motion. Note any pain elicited and loss of motion. The supraspinatus is isolated with the arm forward 90 degrees in the scapular plane and the forearm rotated into pronation (ie, thumbs down). If drooping of this position occurs, full-thickness rotator cuff tears are suggested. The subscapularis may be tested with the arm at the side with internal rotation resistance. However, this can produce false-negative results; instead, place the arm internally rotated with the dorsum on the buttock surface and actively lift the hand from the buttocks against resistance. The external rotators, teres minor, and infraspinatus can be tested with the arm on the side and in 90 degrees of abduction. 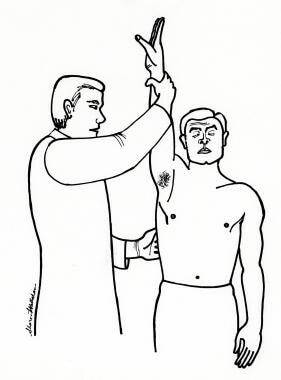 Neer impingement test: An injection of 1% lidocaine into the subacromial bursae, using the lateral or posterior approach, creates signs of relief on forward flexion in patients with rotator cuff disease, distinguishing cuff disease from other sources of shoulder pain. However, rotator cuff tears are not distinguished from early stages of inflammation or fibrosis. An emerging consensus suggests that the etiology of rotator cuff disease is multifactorial. Extrinsic factors exist, such as the morphology of the coracoacromial arch, tensile overload, repetitive use, and kinematics abnormalities. Intrinsic factors also exist, such as altered tendon vascular supply, microstructural collagen fiber abnormalities, and regional variations.